The Miag-ao Church, located in the southern municipality of the same name in Iloilo is one of the four Baroque Churches of the Philippines that have been collectively designated as one of the UNESCO World Heritage Sites. 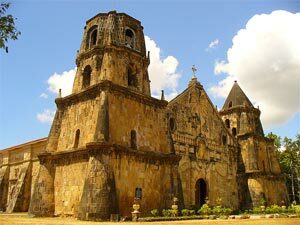 I’ve already featured one Baroque Church before and that’s the Paoay Church in Ilocos Norte. Two of the most striking features of Miag-ao Church, officially known as the Church of Santo Tomas de Villanueva, are its two massive belfries (quite visible in Google Maps; see the thumbnail to the left) and an impressive bas-relief facade depicting a coconut tree and St. Christopher carrying a child Jesus. The belfries served as a watchtower to look for marauding Moros coming from the south and the church itself was built with thick walls and supposedly has secret passages as a means of defense. It is because of this that the building is sometimes called the Miag-ao Fortress Church. The church was built between 1786-1797 by Augustinian missionaries. Standing at an alcove above the main door is a statue of the church’s namesake, St. Thomas of Villanova, a Spanish friar. And the main material used in erecting the church is the distinctive yellow adobe made from the clay found only in this part of Panay island, giving the church a warm golden look. If you want to learn more, WaypointsDotPH has a great write-up and set of pictures. And for really more info, this webpage contains a very detailed history of the Miag-ao Church excerpted from the The Miagao Church Bicentennial Yearbook.